Mathilda Gregory is a writer and performer, and a journalist specialising in feminist reaction to popular culture - geeky and/or lady-centric culture in particular. She likes to write about women, sexuality and pop culture. She also likes to write about radical femininity, feminism, fairy tales and fatness. She's a comedian and a comedy writer, and is always interested in new and challenging approaches to comedy. 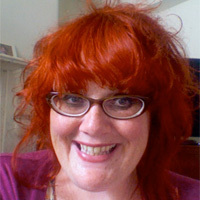 She's reviewed for Fringe Guru in Brighton and Edinburgh since 2010.